Potli bags have been in use in India from ancient times. They had applications in Ayurveda (the ancient Indian form of medicine) where they were filled with herbs to give massages and find mention in the ancient Indian texts as well. Laxman used them to carry the medicines, articles of day to day use and weapons of lord Rama when he went on an exile for 14 years. In Mahabharata they were used by Pandavas to hide their weapons when they were hiding in the forest. Today's potli bags have evolved from the ancient times. They now have a gorgeous look along with embellishment of embroidery from Kutch or Banaras, Sequins, Mirrors, Beadwork of Bhopal, Stones, Pearls, Diamonds on various cloths like silk, velvet, satin etc. They are made in various parts of India. 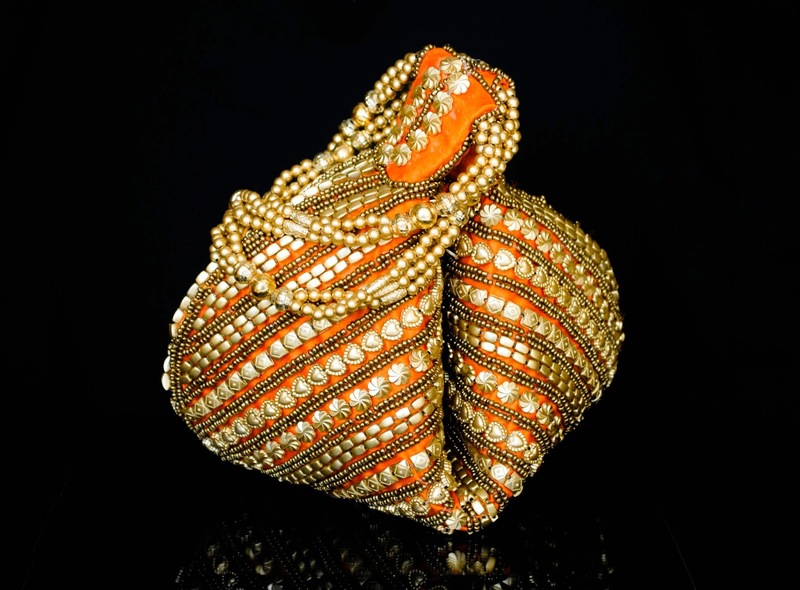 Potli bags and batwas of Bhopal are especially famous for their intricate designs. The nawabs of Bhopal patronized the beadword and zardozi artisans and have played a key role in keeping this beautiful craft alive. The streets of the old city of Bhopal hum with the 500-year-old craft of gota, zari and beadwork with which the Muslim ladies of the city make these unique bags, batwas, jewelry pieces and men's headgear. The glittering handcrafted items have a special flamboyant charm, the attention to detail being an intrinsic part of the craftswomen's creativity. The motifs too are typically Islamic art-inspired, a fascinating depiction in beadwork and zardosi of arabesques, intertwining floral and vine motifs and geometric configurations. 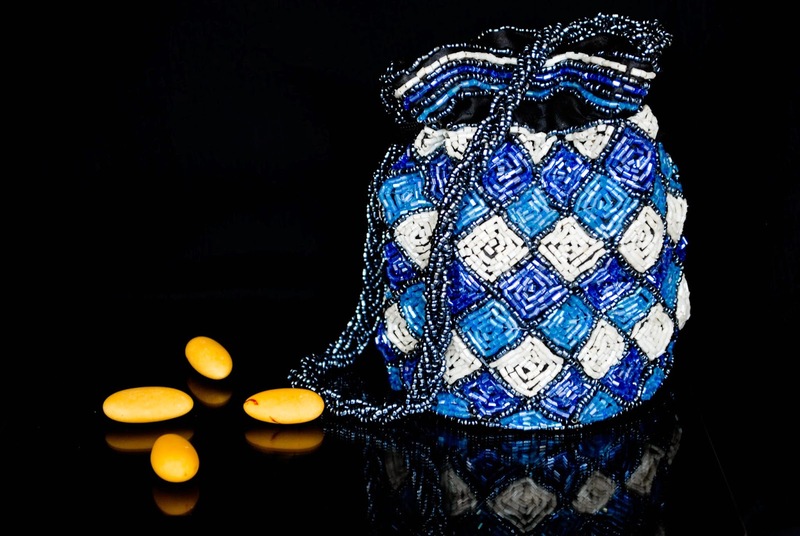 Potli bags and batwas are a gorgeous women's accessory for all occasions. There are more colorful ones for marriages and traditional occasions and sober ones for day to day use. Brocade work bags are especially very bright and colorful. They are made of brocade cloth and have golden/silver bead work on it. They typically close with a zip and also have a magnetic button to make them fold in. Bangle shaped handles enhance their beauty even more. Beautiful evening accessories, they can be worn like a bangle on the wrist and are a great gift for any occasion, from birthdays to weddings. Many bollywood actresses are fond of these bags. Rekha is so fond of her golden potli bag that she has been photographed with it multiple times. Kirron kher, the current MP from Chandigarh has been seen with them matching with her glamorous sarees. Nandita das was seen with a perfectly matching potli purse, made from the same golden cloth as her kurta! If you have not tried a potli ever, you are missing the magic of India. Chanderi saree is among the best known items of the state of Madhya Pradesh in the middle of India. Chanderi Textiles has been in existence ever since Moghul periods and even got mentioned in the Govt. gazetteer and various other history books printed on Chanderi. Chanderi town is situated between the mountains of Vindhyachal in the Ashok Nagar city, North of Madhya Pradesh ( MP ). The advancement of Chanderi started in 1890's after the weavers switched from handspun yarn that was a tad coarse and hard to print as compared to mill made yarn. In early 90's, the noble family of Gwalior, brought the chanderi saree under their patronage and then during that era the famed golden thread motif started existing in the main body of the cotton fabric muslin saree for the first time. Eventually, the silk yarn and then gradually dobby and jacquard use originated The preferences of Indian females was evolving was in the 90's and to keep up with the changing times, the chanderi artisans moved to weave yet another variety of fabric which blended a silk warp with a cotton weft. Several beautifully stunning motifs include 'Nalferma, 'Dandidar, 'Chatai', 'Jangla', Mehndi wale haath' etc. With around 3,500 looms in working condition, 18,000 people are directly or indirectly dependent on the enterprise for their living. This field has matured over the years and has attained eminence in all respects as a consequence of a blend of long-established and modern practices besides the deft skills of weavers honed by institutional assistance by government and other agencies. The Chanderi fabric is known for its texture, light weight along with a glossy look and feel that puts it apart from factory made textiles. Historically, the fabric was weaved using hand spun yarn, which accounted for a soft texture. The artisans spent several hours in spinning the yarn to ensure that it grade, designs colors and motifs are in line with the desires of the exclusive and royal clients Chanderi was always woven with handspun cotton warps and wefts. It was in fact spun as fine as 300 counts, and perhaps was as treasured amongst cotton fabrics as the famed muslins of Dhaka. However, the Industrial transformation sounded the1st death knell for this exquisite textile. The British brought in inexpensive 120 to 200 count cotton from Manchester, which considerably eroded the market for the more pricey Chanderi cloth. In the 1930s, Chanderi set off to work on Japanese silk. They started substituting this in the warps in natural cotton series, after that devised a silk-by-silk variety whereby their profits were considerably more. For that reason, in these times, it is not easy to get a natural cotton-by-cotton Chanderi saree in retail stores. Since the beginning of the Chanderi fabric material and Sires, the buttes on the Fabric are hand-woven on Handloom. Absolutely no machines are used in manufacturing and it is Gold coated, Silver coated and Copper coated. At present tested Zara Butte are also widespread and in usage. The tested Zara is produced with the use of Synthetic yarn. The buttes are created by the use of fine needles. Number of needles made use of depends upon the number of buttes and its size. For each Butte/Butta separate needles are recommended. The weavers associated have gained expertise in this over an extensive period of time. The most well-known and traditional variety of Butte is Asharfi Butte, which is in shape of Asharfi ( woven in pure gold and silver Zara and now a day it is also woven in Tested Zara ). This kind of Butte was in use in past only by the Royal families because it is very expensive as genuine Gold and Silver is used. The Butte which is big is size is popularly called as Butta with all other specifications. Phulkari manifests itself in multiple forms. One of the most famous forms is the heavy bridal bagh dupattas gifted to brides and work during marriages.